I’ve mentioned this in the past, that the Husband sometimes has issues with fish, but I have to say he is getting better. One of his biggest fears is our little mackerel! I think past experiences with the smoked stuff has turned him off but I’m please to say he really liked this dish! 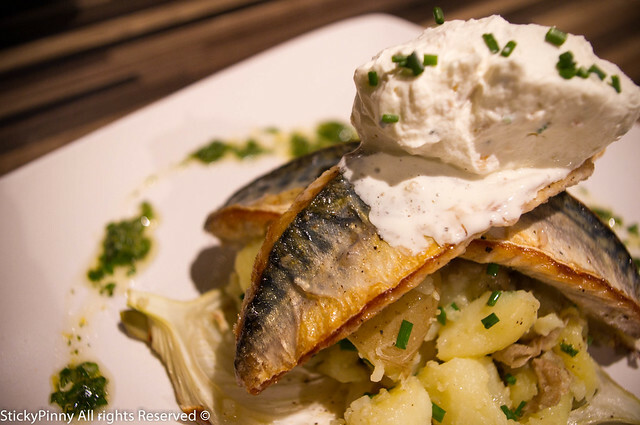 Pan fried mackerel with crushed new potatoes, roasted fennel, a punchy gremolata and horseradish cream. The zesty, acidity of the other elements really offset the oiliness of the mackerel! The inspiration for this dish came from my visit to Create Restaurant in Leeds and I think this will be come a staple for us. It’s an easy mid week supper but also an impressive main meal for entertaining – definitely recommended and I think it is a perfect dish for those who are unsure our silver friends. This should work with any other oily fish, but only oily fish – the strong flavours will just overpower any other. Put the new potatoes onto boil until cooked. Whilst this is happening, slice the fennel lengthways, drizzle with olive oil, season and pop in a moderate oven 180°C for about 15 minutes until tender and keep warm. For the gremolata, place the parsley, lemon zest, juice,garlic in a food processor, whiz and trickle in some olive oil until you get a pesto type of consistency. Season to taste and set to one side. For the horseradish cream, whip the cream until thick, add the horseradish, some chopped chives and season. Once the potatoes are cooked, throw in a small handful of chopped chives, drizzle with olive oil and crush with a fork. Season, cover and keep warm. Put a frying pan onto heat and add a drizzle of oil. Season the fillets and then add the fish fillets to the griddle – skin side down – and cook for 2½ minutes. Carefully turn over and cook for about a minute on the other side. Assemble on the plate in which ever way you wish and devour! !